One of my goals for this year has been to increase my general strength. And may be a tiny bit competitive? I mean…This is not a competitive exercise. So, not to put too fine a point on it; my starting level was zero. Nil. Zip. 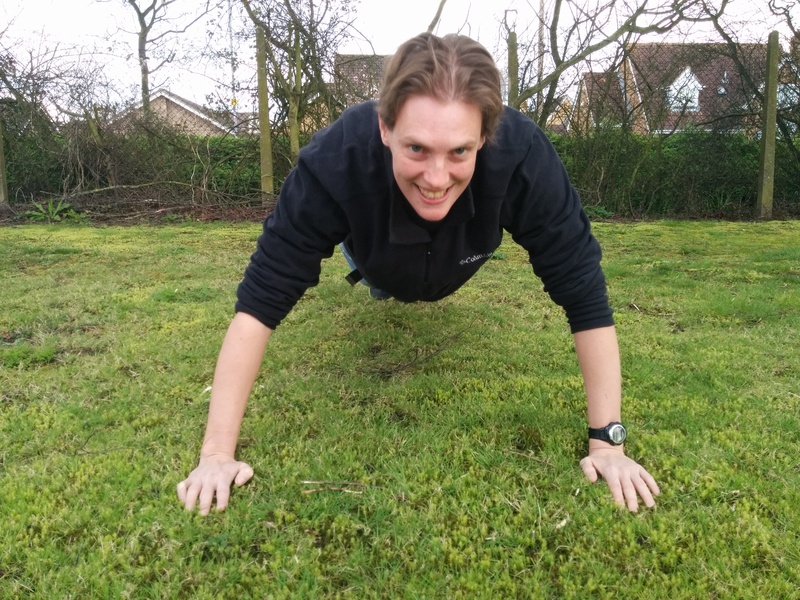 I couldn’t do a full push up (or press up for my British readers). It was therefore agreed that we would begin with knee push up. I don’t think, it’s helpful define things is black and white in this manner. I want to be in the business of improving and encouraging. So, as long as there is improvement then I feel that we need to allow people to work out their own level. As I said, at the start I couldn’t do a single push up with good form. If this is the only way to define a push up, this challenge would have finished before it even started. And I definitely wouldn’t be any stronger now. OK, maybe I would have persevered, kept trying to lift more than I could manage. It’s unlikely that I would have been successful, more likely, I would have given up for want of seeing improvement or even worse ended up injuring myself. Rant over, back to the story. So knee push ups it was – with a hope of eventually progressing to full push ups on my toes at some point. The first day, I thought I might never complete all 100. Even on my knees, I could only manage short bursts of 5 or so before collapsing. It also highlighted a difference in strength between my arms/shoulders. One side was definitely working harder. In fact, at the end of the first week, whilst I had managed to increase to 20 reps in one go, my right shoulder was painful. Although it really wasn’t a competition, the childish part of me relished the days I was able to text “100” before Kay. It was all going so well, I was loath to take a break. However, I knew that a short break now could prevent a much more significant injury later. A mere 2 days of rest was enough and very soon I was back in the game. Point proven, I gave myself a pat on the back for my restraint. Two weeks in and I was clearly getting stronger. Both in my arms and my core. This encouraged me immensely. 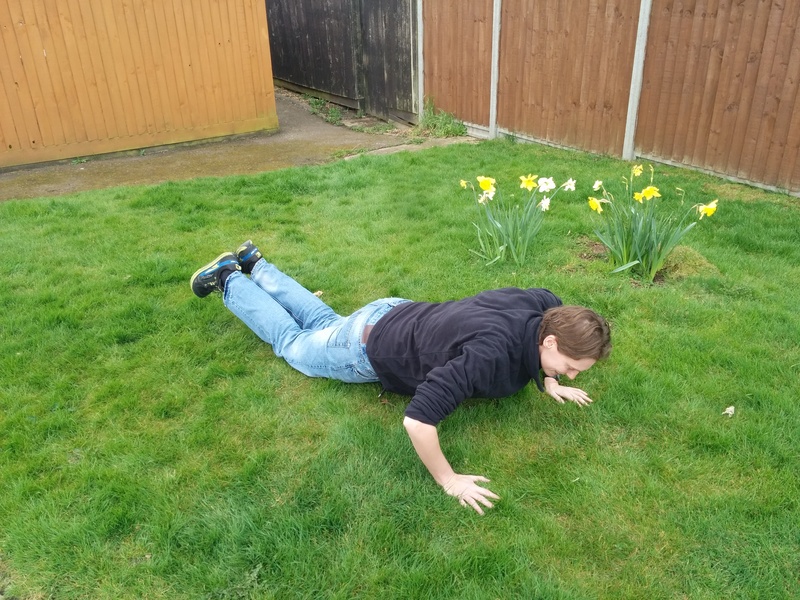 At the 3 week mark I decided to step things up and see if I could include a few full push ups – on my toes, something I couldn’t even consider 3 weeks ago. I decided to attempt 5 full push ups at the beginning of each 20 push up set. I wasn’t sure whether I could do it, but we all have to start somewhere. The first one felt significantly easier than I remembered and I was initially buoyed. The following 4 were harder. My abs screamed and my arms shook. But I did it, 5 full push ups, followed by 15 of the knee version. Day 30, which had seemed so far away when I started this challenge was suddenly upon me. 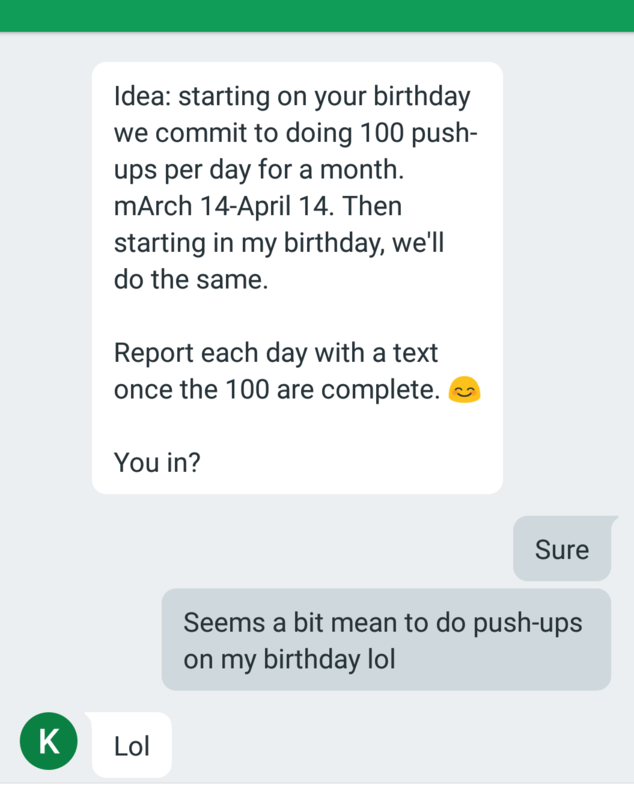 I doesn’t matter that I didn’t achieve 100 full push ups. The improvement in my strength and form has been significant. There’s even a new, if not huge, definitely verifiable muscle in my arms now! Hopefully I will be able to maintain and even continue to increase this level of strength to continue the momentum with 100 hip bridges each day. I’ll let you know how it goes.